I adore cheesecake. Thick, creamy, sweet. I have to say, my favorite cheesecake is plain, nothing baked in, just the cream cheesy goodness. Sure, I’ll top it with a variety of different things, like chocolate ganache, whipped cream, fruits, lemon curd. But when it gets right down to it, just keep the cheesecake portion PLAIN. I made a tiny exception here. I knew from the get go I wanted to top this cheesecake with a raspberry gelee and fresh berries. That was a no brainer. I had just been shipped a flat of Naturipe Red Raspberries, and they were burning a hole in my refrigerator. They ached for cheesecake. And if you’ve been reading here for any length of time and you keep a journal on all my idiosyncrasies, you know I don’t like crust. At all. Other than the fact that it holds a cheesecake in place, it’s nothing of use to me, so typically I omit it altogether. Instead of crust, I wrapped this cheesecake with toasted coconut flake, which was both gorgeous AND delicious. What flavor! And, it played so well with the tart berries. Knowing I was going with the toasted coconut wrap, I decided to add a tiny bit of coconut extract to the cheesecake. Just another good decision. Sometimes I make them, believe it or not. 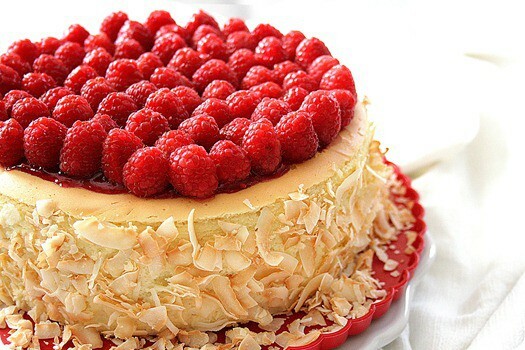 I made this Toasted Coconut & Raspberry Cheesecake to take to a family Thanksgiving, and it was a huge hit. Believe it or not, I was left with one scant piece at the end of the day, which I promptly ate after our 3 hour drive home. I couldn’t very well throw it out, could I? These raspberries were excellent. It is rare that I use a berry in the off season, as we grow our own raspberries, blueberries, blackberries and strawberries. But, when these Naturipe showed up, they were a thing of beauty. So fresh! I was literally afraid Seven was going to eat them all before I could get them on to the cheesecake. He’s a mad man for berries! Honestly, this recipe for cheesecake is the only one I ever use. Ever. Yes, I will sub out orange oil, coconut extract, lemon zest, even a bit of mint on occasion, but the main recipe? I will NOT change it. 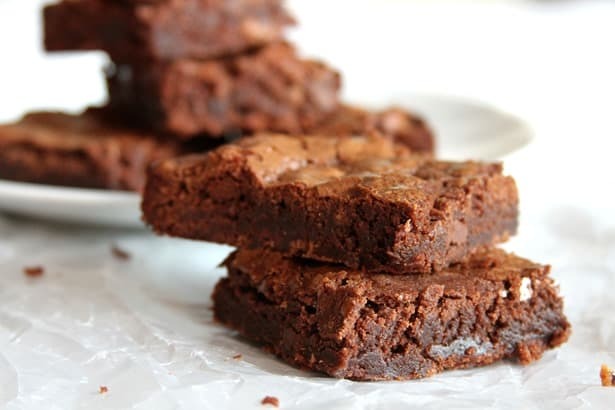 it bakes off perfectly, always creamy, rarely (if ever) cracks, and garners rave reviews each and every time I make it. Give it a shot, I think you’ll love it! Preheat the oven to 335 F and grease or butter an 8-inch cake pan. Place a round of parchment paper on the bottom. Spray the pan and the parchment. If you are wanting a crust, now is the time to make it. 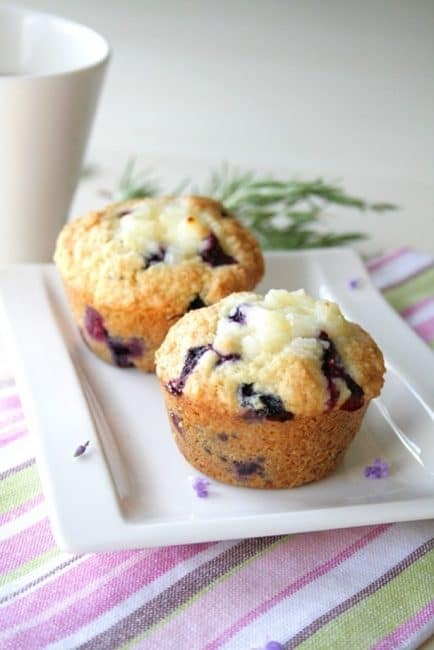 Place one 8-ounce package of the cream cheese, 1/2 cup of the sugar, and the cornstarch in the bowl of a stand mixer. Beat on low speed until creamy, about 3 minutes, then beat in the remaining 3 packages of cream cheese. Increase the mixer speed to high and beat in the remaining 1 1/4 cups of the sugar, then beat in the vanilla, coconut extract, and salt. Blend in the eggs one at a time, beating only until completely blended. Be careful not to overmix the batter. Slowly mix in the cream and sour cream until just combined. Pour the batter into the prepared pan. Place the pan in a large shallow pan containing hot water that comes about halfway up the sides of the pan. 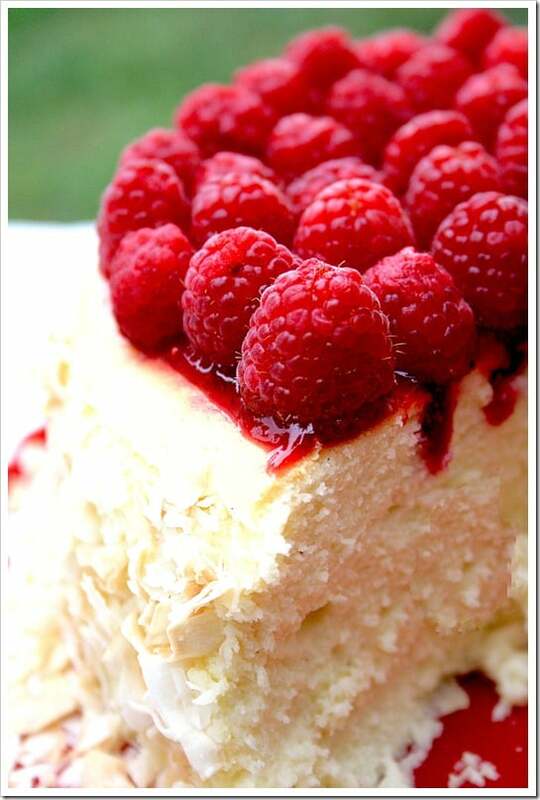 Bake the cheesecake until the top is lightly browned, about 1 hour and 25 minutes, or until the top is lightly browned and center is set. Allow to cool in the oven with the door propped open. 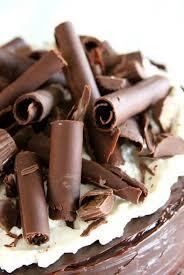 Cover the cake with plastic wrap and refrigerate until it’s completely cold, at least 4 hours or overnight. 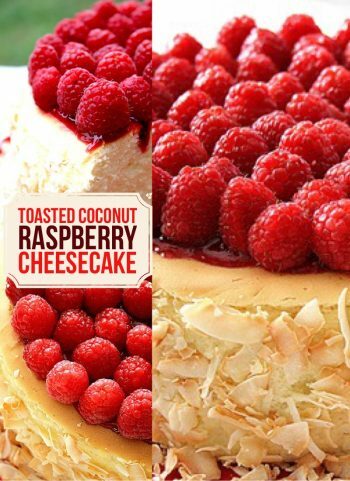 Press the toasted coconut into the sides of the cheesecake. Spread raspberry gelee to within 1/2 inch of the edge of the cheesecake. 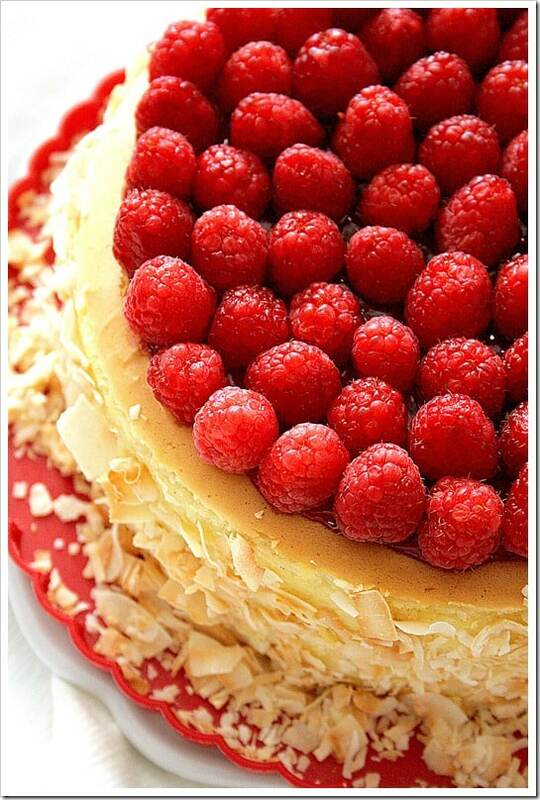 Place fresh raspberries in a circular pattern around the top. 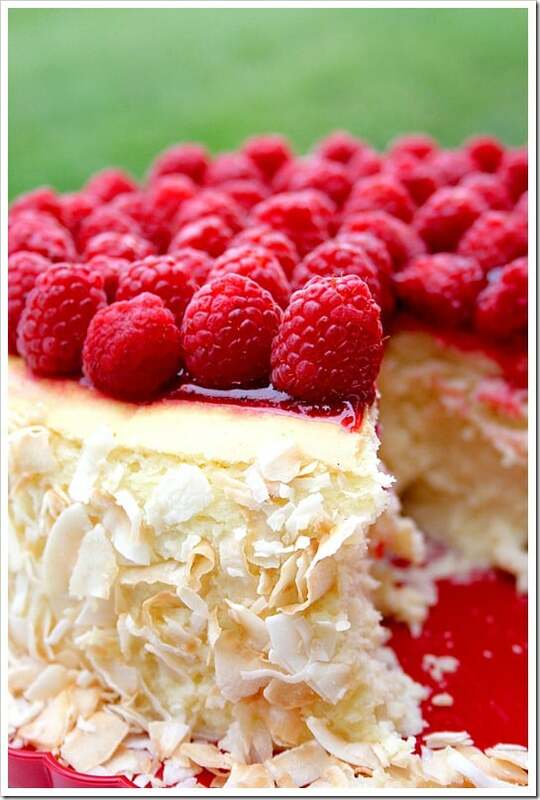 Raspberry gelee – 1 cup fresh raspberries, 3/4 cup sugar. Reduce in small pot over medium heat until thickened. Allow to cool. Toasted Coconut – 2 cups coconut flake. 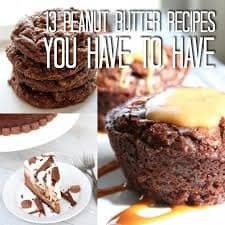 Spread onto baking sheet and toast in 325 oven until lightly browned, stirring every 5 minutes. Raspberries are an excellent source of vitamin C, folate, iron, potassium, antioxidants and disease-fighting ellagic acid. Ellagitannins, a family of compounds almost exclusive to the raspberry, are reported to have anti-cancer activity and contribute to the raspberry’s antioxidant power. They are also a great source of fiber, which has been found to lower cholesterol levels. 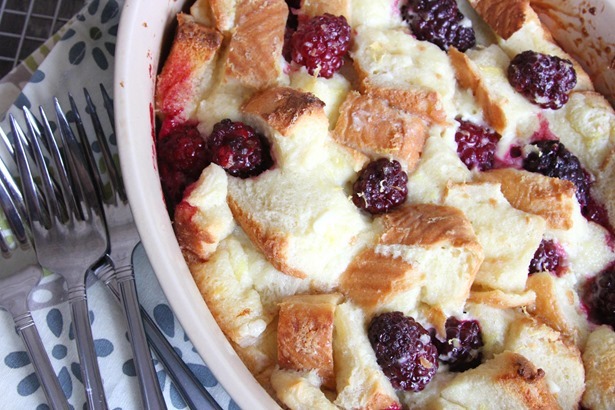 French toast with seasonal berries…yum! 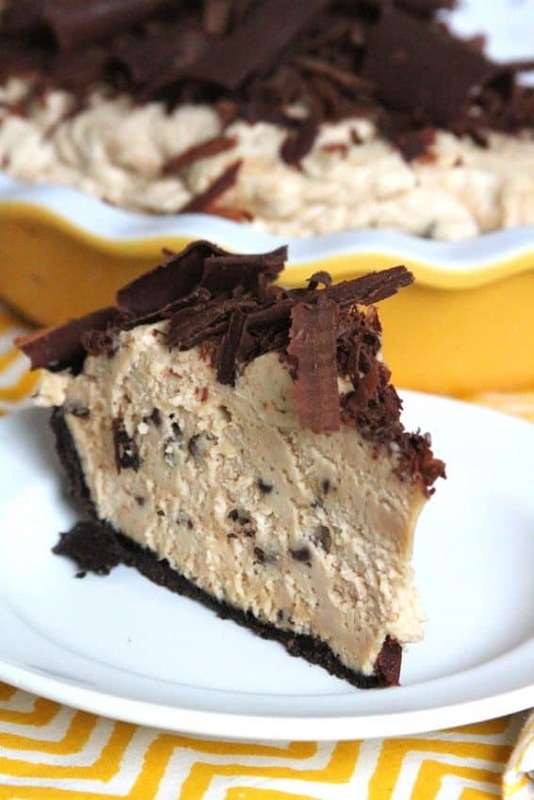 Can this be turned into a chocolate cheesecake?